I’m on the countdown , nearing the finishing line and hurtling up the home straits – yep I’m finally getting closer to completing the illustrations for my FIRST EVER book illustration commission – ‘Jessie and the Scaredy Cat Brain ” by the lovely Dr Allison Waters . “Jessie ” is a book about a girl with anxiety . It’s going to be used by Dr Waters in her research and therapy to help children with anxiety . Which is just beautiful . In fact , little anxious Jessie, her Scaredy Cat Brain and Happy Cat Brain have become buddies of mine . I have to say though , they’ve gotten up my nose and , indeed caused me , their artist designer , to want to say very unkind inappropriate things to them when they have raised my levels of anxiety when the little darlings have refused to sit still long enough for me draw them in a different pose, or when they don’t seem to want stay around long enough for me to find a way of positioning them on the page .. but they are pretty annoyingly cute and endearing at the same time . I love them . I do . Really . But , even though this project is drawing to a close , some late nights of work in the art studio are still to be had . I have to say though , they’ve at times gotten up my nose and , indeed caused me , their artist designer , to want to say very unkind inappropriate things to them when they have raised my levels of anxiety when the little darlings have refused to sit still long enough for me draw them in a different pose, or when they don’t seem to want stay around long enough for me to find a way of positioning them on the page .. but they are pretty annoyingly cute and endearing at the same time . I love them . I do . Really . Lets just hope I don’t have to foster out Jessie and her feline friends before I finish . So, my blog post today is dedicated to a precious girl , called Olive , aged 10 . I hope you get to see this Olive . And Olive, we also don’t really want our humble abode to be eaten by another type of ant – termites .And your lovely pest inspector dude dad sprayed our ever growing termites nest in the front yard so they won’t eat up our house ( more little sods ) which is nice. The reason this pest inspection was extra specially cool though Olive, was actually because I ended up having a nice chat with your pest inspector dude dad about martial arts, the tough lifestyle of a chef, ( his former occupation) , difficult rude customers , being a parent, and , you know ,other boring stuff that grown ups talk about..
And , as well as enjoying the chat , your Dad made me reflect , that I am really super blessed to be doing all this illustration work for kids . I am blessed , Olive, that I have some big publishers now wanting to put my messy scratchy artwork in their files for future children’s books. Even though that’s great – the reason I am REALLY blessed is because I can draw crazy pictures which will be going in books , that will bring happiness to children , just like you Olive- precious daughter of the pest inspector dude , who gave up his chefs job which involved long shifts that kept him from his little girl (you) and that had left him too tired to interact with her (you) when he wasn’t working so he left that job, so he could be with you a whole lot more. He loves you so much . That was obvious . So Olive, I hope you get to read this post. You are on my heart , because I have a 10 year old daughter too and her dad and I love her just as much as your dad does . Which is why I drew Cupcake Marshmallow Sunshine the Unicorn for my girl …and for kids just like you . And here is for the next picture going straight into my portfolio…. The follow up picture to this one I shall post tomorrow . And why is this feverish update occurring you say ?? BECAUSE , I am going to my first ever ever EVER, Children and young adults (CYA) author and illustrators conference next Friday and Saturday , here in sunny Brisbane Australia and will be having interviews with 4 different children’s book publishers wherein my portfolio will be perused mercilessly and honestly by said editors . Shall need to grow a thicker skin , just in case , by Friday . I’m so excited !!!! I’m like a kid at Christmas time who still believes in Santa!! This artwork is going in my portfolio for the Children and Young Adults author and illustrators conference . I’ve been burning the midnight candle/iPad working industriously and feverishly to get my portfolio ready for this BIG event . But watch this space as I share my portfolio entries with you all . I love being a mum . And today is Mothers Day here in Australia .. which is nice . Because I’m a mum . When the kids are being ruddy annoying and simultaneously , I am needing a caffeine refuel , let’s just say , it ain’t a pretty scene in the Flett household . 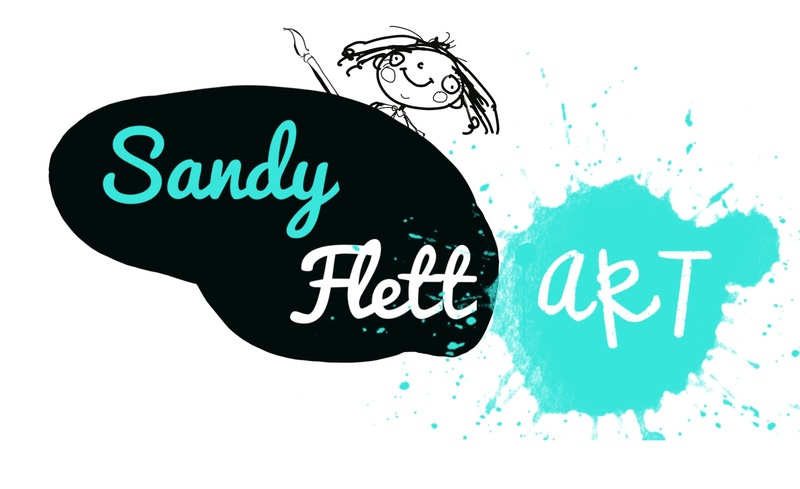 So , yet again I share with you through ” Sandy’s World” cartoon strip, another issue of womanhood – combined “Caffiene Defiency /Offspring- induced Insanity ” . A deadly combination for me , and I’m guessing for many others like me . And even if you aren’t a mum, for whatever reason that may be , I’m sure you ,like me , have had those times when small and large children have been getting up your nose , whilst at the same time you are hankering for your next caffeine injection . For example , imagine you are at your local supermarket waiting in the self serve check out queue . It’s 8:15am on a Wednesday morning and you have only had ONE coffee . And that was at 5:45 am . And you need your next refuelling . And in front of you is a 4 year old with adoring parents who say “of course you can do the scanning sweetie”. So if that is the case for you , I’m thinking this cartoon will have some resonance with you also . And find the full cartoon in the aptly named ” Cartoon” section , under ” Sandy’s World ” in this webpage ….